In a recent paper, Medeiros et al. 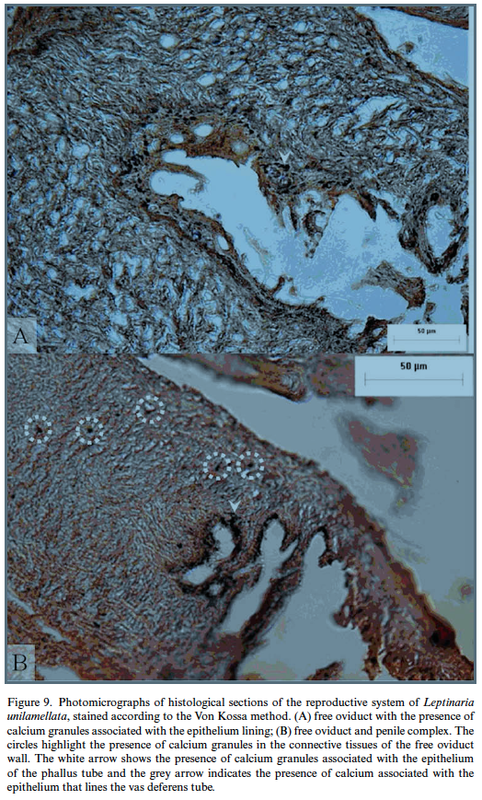 (2013) gave a detailed account of the reproductive system morphology of the wide-spread species Leptinaria unilamellata through histological studies. The results are described at length and with ample microscopic photos. Many tropical terrestrial gastropods, such as Subulinidae, are recognized and classified by their shells, as is the case for Leptinaria unilamellata (d’Orbigny, 1835), a hermaphroditic pulmonate snail restricted to tropical America. We aimed to characterize the morpho-anatomy and histology of the reproductive system of L. unilamellata. We compared the results obtained from L. unilamellata with the available data on the reproductive system of other subulinid species. The main distinctive characters are those of the penial complex, such as the proportion of the length of the penial complex and the length of the free oviduct, presence of a flagellum, site of insertion of the bursa copulatrix duct relative to the site of insertion of the penial complex and presence and extension of the penial sheath. In the discussion, reference is being made to “A. fulica and A. monochromatica” (p. 2401); given the context it is not clear that the authors likely meant species classified within the genus Achatina. the reproductive system of Leptinaria unilamellata (d’Orbigny, 1835) (Mollusca: Pulmonata: Subulinidae) — Journal of Natural History 47: 2385–2407. This entry was posted in Uncategorized and tagged anatomy, literature, subulinidae on December 24, 2013 by bramb.